Maryland winery, Old Westminster, recently made their wine debut in Massachusetts! The Baker family is producing Maryland wines with an ethos parallel to all natural European winemakers: hand harvested grapes, indigenous yeasts, and minimal filtrations and use of sulfites. Read more about the family wine affair in the Washington Post here! 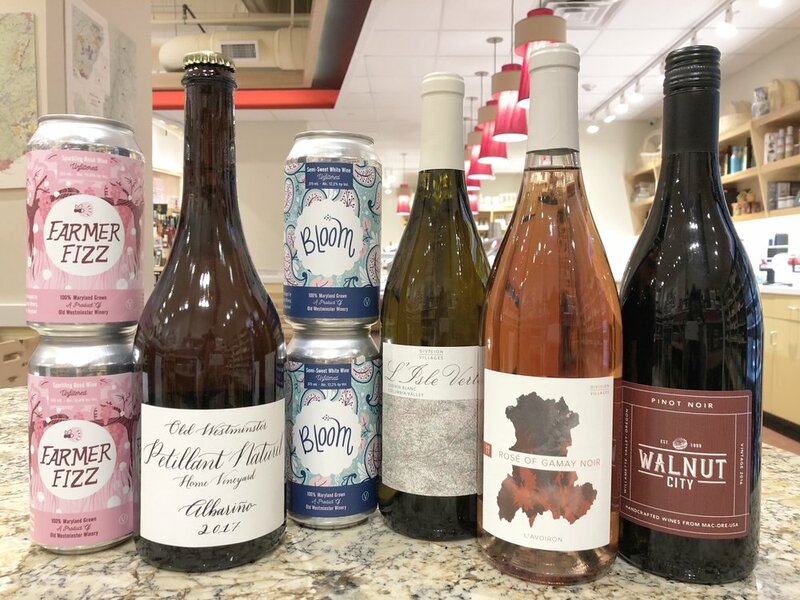 On Saturday, Jackson is pouring Old Westminster’s sparkling Albariño, as well as their newest canned wine! Sold in single 375ml cans, this juice is made with the same care, and with the same quality fruit, as their bottled wines. It's the most natural canned wine around town. Buy up these cans for a hike on a sunny day, or a Sunday picnic! Delicious semi-sweet blend of Chardonnay, Vidal Blanc and Muscat. 100% Maryland grown. Fermented with wild yeast and canned without fining or filtering. Sparkling estate vineyard Chardonnay. 100% Maryland grown. Natural Wine. Wild yeast, no fining or filtering. Dry, delightful expression of Albariño with notes of guava, passionfruit, lime and a salty, long finish. Pear with oysters, oysters, oysters. Now let’s jet off to the West Coast, to Portland, Oregon, to visit the urban and artisan wineries, Division Wine Co. and Walnut City WineWorks. Division Wine Co. is in the heart of Portland, and Walnut City’s tasting room and vineyards are an hour south of the city in McMinnville. This Chenin Blanc is grown on quartz and lime Silica soil in Willard Vineyard in Columbia Valley and has notes of river stones, beeswax, and lime zest. A rosé of Gamay Noir features a crazy amazing, fresh strawberry fruity nose with watermelon and high-toned fresh cut grass and warm chalky earth beneath. There’s also a really nice finish of sour cherry and cherry pit. Walnut City WineWorks winemakers produce high-quality wines from grapes planted and nurtured in the Willamette Valley in Oregon. This Pinot Noir has notes of purple flowers, dried herbs and wet earth giving way to tart cherry, raspberry and rhubarb. This is perfect to bring along camping, on a boat, on land, on a patio – everyday REAL Pinot!